It is more important than ever that people with responsibility for health in the workplace share good practice. Dame Carol Black’s report, published in March, offers a ‘once in a lifetime opportunity’ to put occupational health at the centre of the health service. The Occupational Health Awards are an important way to identify and spread good practice to support this vision. Many of you have made a difference for the better in your organisations and I urge you to get your entries in now, and have your achievements recognised. Entering is easy and it is free. 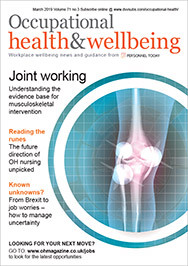 Our columnist Sharon Horan hails the Black Report as the most important development in workplace health since the birth in the 17th century of occupational health pioneer Ramazzini. In this issue, we open the debate between the wide range of professional groups involved about who should be doing what. Some have been complaining that the Black recommendations could lead to a watering down of their skills or professional standing. Others doubt that GPs are competent to provide useful information for employers. Meanwhile, OH physicians have demanded leadership of the proposed fit-for-work teams, which smacks of old-school territorialism. But for those who have waited decades to see workplace health put on the political map, the Black Report is an opportunity that we cannot afford to miss. All of us should support Dame Carol’s proposals and seize the unique opportunity they present.